Ah, summer. Something other than bananas for the morning cereal. And especially wonderful if your fruit topping can be picked locally–as in 30 feet from the back door. 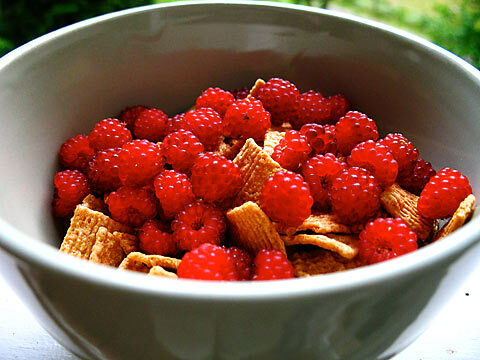 These are “wineberries”–a kind of raspberry that is prolific along some roadsides this time of year. We had a nice patch growing wild down our road, but that wasn’t close enough for some of us. So now, we go out to the transplanted bushes just behind the house, and eat them fresh from the canes. In all honestly, I think they have more going for them in the color than in the taste department. We toss a handful into the blackberry jam, too, for a dash of contrast. Theme for the day: berries, pickles and beans–the crops are coming in! I picked about five quarts of these from bushs growing on the road into our community the other day. They’re great on yogurt. Next Next post: How Well Do Your Grandchildren Know You?